A boy wants to fall in love. An actress wants to be famous. And the kids of American astronauts want to name the new Gemini rocket "Herman's Hermits." And I thought the 60s were radical. But, then, there never was anything radical about Herman's Hermits. That's "Herman," Peter Noone, and four other guys whose names are probably one of those Trivia Crack questions nobody ever gets right. 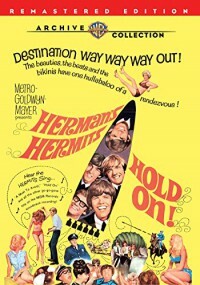 Including me, and I own more than one Herman's Hermits album, one of which is the soundtrack for this film. For the record, they are Karl Green, Keith Hopwood, Derek Leckenby, and Barry Whitwam. They're all in this movie, though they rarely speak other to remind Herman that he's the leader and that's his job. Shelley Fabares plays the girl Herman falls for. Her performance is like a breadcrumb in the past of Christine Armstrong of Coach, featuring some of the same mannerisms. She even gets to sing a song. Since I mentioned a soundtrack, that begs the question whether there is any reason to see the film. Now hang on; gimme a minute to think. To be honest, this is harmlessly entertaining fluff, with a good bad joke and one truly funny line, and a gaggle of go-go girls to goad you into a nostalgia trip. But if you like Herman's Hermits and you can't play vinyl anymore, it's foot-tappingly fun. Story goes that the film was going to be named after a different song, but then somebody realized that "A Must to Avoid" probably wasn't a message they wanted to send to the moviegoing public. The natural title might have been "Make Me Happy," but that's Fabares' song. Oh, well, they're all good songs. Come to think of it, that is pretty radical.